Fantastic build quality! Nobody else seems to finish their laser cut wood stuff, but this shows how good it can look when you do. Lesson 2: Wherein we commence to prepare for the Feast of the Cat. Section A: A guide to proper roasting. Section B: A guide to getting a new house after burning down the old one. Illustration: Mommy, Daddy said he was baking Muffins! I’m not sure if you’re joking, but it has two thermal sensors. Seriously though, nice build and nice finishing… looks terrific! Nice build! 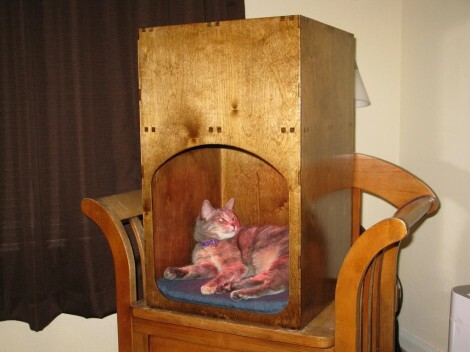 Here’s how this would work with my cat… Go through all this and she would jump on top of it and sleep there. Cats! Nice build. However, I would never rely solely upon a microprocessor to control/prevent something from getting too hot–especially a semi-enclosed heat lamp. All it takes is a code bug, a line transient, or even proximity to some statically-charged cat fur to glitch a processor, and your closed-loop control may go away. A more robust solution would involve the inclusion of a thermal fuse (or even a klixon-type overtemp switch), bonded to the light fixture, to assure failsafe removal of AC power to the lamp in the event of malfunction. These devices are inexpensive, readily available, and standard components in any commercial appliance that is expected to generate heat. Good call. You can even get thermal switches out of old microwave ovens. I disagree. First, proper testing and use of a watchdog timer will deal with most glitches. Second, read the article (or even HAD’s summary) carefully. The fan and other closed-loop temperature control features were found to be completely unnecessary, as even with the lamp running continuously, it wasn’t able to get hot enough to be uncomfortable to the cat; much less pose a fire risk. As a result, the MCU really does nothing at all, nor does it need to. You’d get the same result omitting the MCU completely, and just wiring the lamp directly to a pressure switch. It was already overdesigned with unnecessary safety features, yet you’re suggesting adding more? We await your musing on dealing with the rest of the ‘gliches’, presumably trivial ones of the ‘halt and catch fire’ variety. I’d have simply hinged the false floor, stuck a microswitch under it, and used that to trigger the lamp. Add a thermal cut-out and call it at a day. Tony, a couple of questions for you. It’s easy to claim anything is a serious safety issue, if you either can’t understand, or deliberately ignore, the actual probability of it happening. And I did mention this project won’t catch fire, even if stuck continuously on. Not sure what’s so terribly hard to understand about that. A watchdog timer does not address failure of an I/O bit, the failure of a driver transistor (which often fail-to-short) or the failure of a relay (contacts can stick when eroded.) I’ve seen every one of these failures in the field. A thermal fuse is like a seat belt. If you want to argue that you don’t need a seat belt because cars have other safety features, or because you’ve never had a wreck in your life, then fine. But the belt is the last line of defense when, through unforeseen circumstances, the other safety measure fail to provide adequate protection. As to the criticism that adding a fuse amounts to “over design,” I’d answer this way. You could eliminate the CPU, eliminate the fan, and eliminate the force sensors (replace them with spring loaded microswitch.) You could strip the whole thing down, if you want, until nothing remains but a wooden box with a lamp. I’d STILL install a thermal fuse or klixon. Pi, now those are some good examples of potential failures, which aren’t software or watchdog correctable. But still, in this particular case, I’d say thermal protection is unnecessary; because I cannot see any scenario by which it can overheat. Yes, it sounds scary, being a 50W heat source in a semi-enclosed area. But several light fixtures around my house, if I were still using the incandescents for which they were designed, are nearly 120W heat sources in smaller, fully enclosed areas (thanks to the glass cover). Even they are not significant fire risks, nor do they have thermal protection; despite safety regulations. It appears @Chris C. is God, all of his projects perform flawlessly, with nary a logic bug, brownout or other oddities happening. I find it odd you need a watchdog at all given your talents. You won’t get a product through safety testing where the only safety is provided by the uP, but as you’re such a successful designer you already know that (don’t you)? If your appliances failed due to dead thermal switches, then I’d say they’ve done their job (never mind everyone is talking about the resetable ones, not the fuses). As I said you can reduce this to a switch & the lamp, the thermal switch probably isn’t needed but erring of the side of safety is a good thing. A cut-out timer might not be a bad idea, and that doesn’t need a uP either. PI, you’re going on about all these doomsday scenarios with flipped bits and stuck relays but are you considering what the actual effect of any of these (extremely unlikely) software failures would be? It’s “the lamp stays on”. A fifty-watt lamp, using less power than most incandescent bulbs, and as the creator notes it doesn’t even need active cooling. Even in the worst possible software failure mode, the bulb isn’t any more likely to melt down or blow up or start a fire than a plain old lamp that you leave on by accident. And if the cat gets too hot, it can always leave. While I am not sure what the rating of the thermal protection that are included with the housing, since the housing is rated for a 75 Watt bulb and I am only using a 50W I dont think I am pushing its limits. Well the lamp housing I bought from home depot has a built in thermal protection. I ma not sure what the rating for it is, but since the housing is rated up to 75W bulbs I figured that the 50W was not pushing any limits. While that is there to stop a fire hazard, the other temp sensor are to stop burn the chips and to make sure I don’t hurt my cat. Why would you use propertiary chips like PIC? Use open source atmels instead (like Arduino). Arduino’s are expensive and over overkill, that’s why! Like a pic to turn on a light? Put a uC in it! How else do you get on HaD? There’s nothing proprietary about PIC anymore, it’s now as open-source as Atmel. On the project page, he says he used a 16 bit PIC as a challenge to himself, but from the sound of it he’s familiar with 8 bit PICs. Go with what you know. Long before the days of Arduino, PIC was the hobbyist microcontroller of choice. Some people still like them. I did all of my early hobby projects using PICs. These days I tend towards atmel because of the large community support, but back then it was the opposite. Many people prefer PIC to Amtel as you can still buy the same PIC a few years later. That may have change, but there’s a lot of “don’t forgive & don’t forget” out there. See also: Maxim. Now once the cat convinces him to add in the automatic food and water system, the cat will dispose Herpity. Right, so she manipulated him into building her a custom heated napping area. [Herpity] may want to re-evaluate his relationship with the cat or, as Zack said above, one day he may be met with a rather unfortunate fatal accident involving a steep staircase and a satisfied-looking cat with a curious habit of walking in between people’s legs. Cats have a way of getting what they want. Mine showed this odd behavior at the backdoor. She’d sit there, waiting for me to open it so she could go out. I barely opened and closed the door again when she’d walk back, sit there by the door and wait for me to open it to let her in again. This would go on a few times in a row until my penny dropped: the cat wanted the door to stay open and have free passage. And did the cat ever say “Thank you”? No, its a cat! Be more efficient if you used a magnetron instead of a heat lamp. They make low wattage cat cushions that can stay on all the time, set one on the microswitch platform if you want to save even more power. 50 watts is too much. An ill cat may be unable to get up and overheat and die. The lowest grade bulbs are going or gone, those heat lamps are going to get pricy. Cat looks like a round peg in a square hole not quite the right size, feeties stick out. Those cat cushions are oval shaped with sides just the right height.